The vehicle production figures for Thailand went down for the first time in almost two years, with a 10 percent fall. The big two, Toyota and Honda suffered most from supply shortages as Japan reeled under the impact of the tsunami in March. This produced a 48 percent drop in production for Toyota, and an even bigger drop for Honda which experienced a 59 percent fall year-on-year. 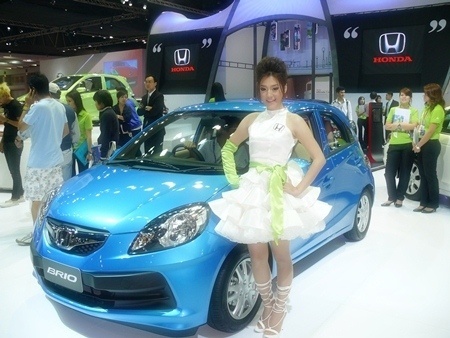 Honda, which traditionally has been the number two in Thailand, finished May as number three behind Nissan, whose sales actually jumped over 75 percent, on the back of their having ready stocks of the Nissan March eco-car and with Honda’s eco-car, the Brio, being available on back-order, Nissan took many sales away from Honda. In the pick-up market, Toyota fell again, bringing Mitsubishi a windfall increase of 195 percent in their y-o-y sales. In the Passenger Pick-up Vehicles (PPV) Mitsubishi went tops with 63 percent of the PPV sales, compared to Toyota down to 20 percent and Isuzu down to 15 percent. However, the market will have stabilized as parts supply from Japan returns to normal by July/August. Despite its initial supply problems, expect to see many Honda Brios on the road by the end of the year. Next articleFoton challenges Vigo down-under. Will it come here?